Nine members were due to attend this but six “fell by the wayside” and only three actually went. A picture quiz of places proved to be interesting but difficult - our table didn’t win! There were scones, butter, jam and cream and strawberries with tea or coffee. A really nice afternoon. A busy day - in the morning there was the Wave of Prayer at Pam’s house, in the afternoon we went to Emsworth for their Garden Party. Unfortunately the weather was not kind to us and the “garden” had to be transferred into the Church Hall. With most welcome cups of tea we were served small cakes and scones. Norma was selling MU calendars and diaries for 2017 and had catalogues with Christmas cards etc. reminding us that we are already half way through this year. At our June meeting members discussed news items especially from our magazine Families First. We had been asked by MU Enterprises to complete a survey regarding possible changes to the magazine and the previous Monday three of us had met to score different categories, for example “News from Mary Sumner House” and “Social Policy and Advocacy” from 1 - 13. This proved to be far more difficult than we had anticipated. I think MU Enterprises probably received some very varied results from the forms returned by the different branches. 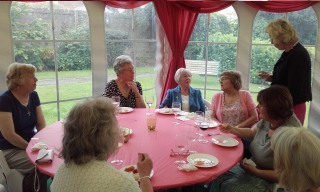 Bishop Christopher had invited branch members to his home at Fareham for lunch. A large marquee was set up in the back garden at Bishopsgrove (which was to be used for several different events). We were welcomed with a cold drink and then found seats at large round tables. A rather splendid buffet was laid out on a long side table and we helped ourselves to rolls etc. some with contents I failed to identify but enjoyed thoroughly nevertheless. After a savoury course, delicious cold desserts appeared - and were happily consumed by the assembled guests. On a hot sunny day (summer had arrived at last!) Margaret and I went to Holy Trinity Church at Gosport by car. We had thought of going by ferry until we realised that not only did we need to take 2 dozen small cakes with us but also the branch banner! My husband dropped us outside the church, we couldn’t persuade him to stay for the service - he went around the Submarine Museum instead! As we were really early we “parked” the banner against a wall and went off to find a coffee. Back at Church the banner bearers had a short “talk through” before the service began. 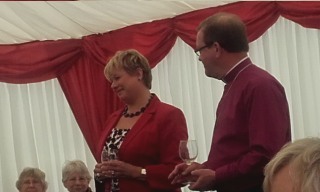 The service was celebrated by The Rev Dr Trevor Reader and the MU Diocesan President the Rev Elizabeth Groves with an address by our Provincial President, Nikki Sweatman. Afterwards we all re-gathered at Walpole Park where we had coffee and sampled (several) of the small cakes everyone had brought. I arrived at the Church Hall about 1pm, with two platters of sandwiches, a box of bics for the raffle and some serviettes I had found in Asda’s which I hoped were “Mothers’ Union Blue”. I had also bought two cakes in St George’s Market that morning - just in case we ran out. 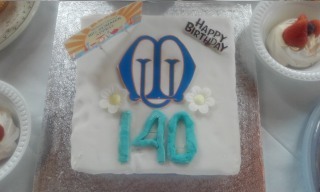 I found that other members had had the same thought - we did not run out of cake! Guests began to arrive soon after 2pm. We put out the buffet onto two long tables at one end of the hall and made pots of tea in the kitchen. 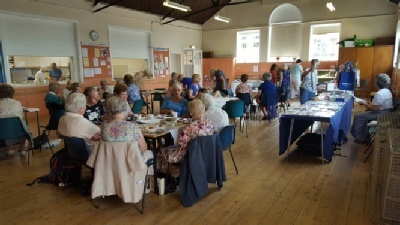 Margaret had devised a table quiz which was Queen themed, we had a Bring and Buy table, a treasure hunt, guess the number of sweets in a jar, and a table selling MU cards and merchandise - as well as a raffle. Hopefully everyone had a good afternoon and £147 was raised for our World Wide Fund, which does not include the contents of our WWF collection boxes which will be counted later.